Aiseesoft Mac FoneLab is the best and easy-to-use software which can help users recover and backup various datas on Mac from iPhone XS/XS Max/XR/X, iPhone 5, iPhone 4s, iPad Air, ipad mini 2, iPad 4, iPod touch 5, etc. It can also help users recover data from iTunes backup files. Besides, it supports various data such as Contacts, Messages, Call history, Calendar, Notes, Camera Roll, and Photo Stream, etc. Now it newly support iOS 12 and iTunes 12.8. As for iPhone 4/3GS, iPad 1 and iPod touch 4, it can recover Text Content(9 types): Contacts, Messages, Call history, Calendar, Notes, Reminder, Safari bookmark, WhatsApp, App Document. And Media content(10 types): Camera Roll, Photo Library, Photo Stream, Message attachments, Voice memos, WhatsApp Attachments, Voicemail, App Photos, App Videos, App Audio. As for iPhone XS/XS Max/XR/X/, iPad 4/3/2/Air, iPad mini/mini 2 and iPod touch 5, it can recover Text Content(8 types): Contacts, Messages, Call history, Calendar, Notes, Reminder, Safari bookmark, WhatsApp. 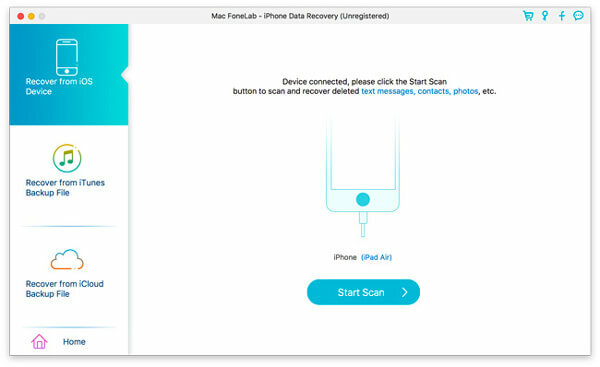 This Mac recovery software enables you to extract data from iTunes Backup for all Apple devices, including iPhone SE, iPhone XS/XS Max/XR/X, iPad mini 2, iPad Air with aplomb. Besides, it supports 11 types of files such as Contacts, Messages, Message attachments, Call history, Calendar and Notes, etc. 1. Optimize data display interface. 2. Add the function of importing recovered contacts to device. 3. Remove the 30-days-limitation of trial version.